Enteric fever is a very common infectious disease in tropics, associated with high morbidity and mortality. The most common clinical presentation of Salmonella More Details infection is gastroenteritis. Mycotic aneurysms are rare complications of Salmonella infection. Such aneurysms usually involve the aorta; however, it occasionally involves the iliac arteries. Solitary iliac artery aneurysm (IAA) represents approximately 0.4%–1.9% of all cases of aneurysmal disease. Very few such cases have been reported in the literature. 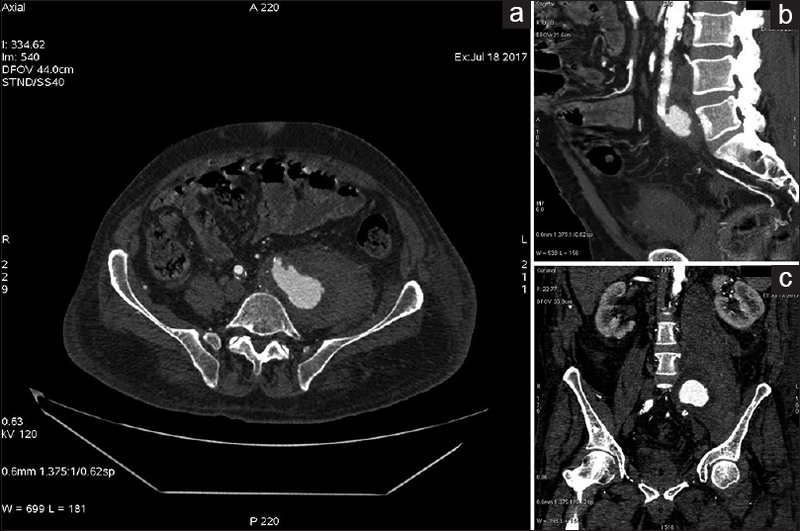 We are presenting a rare case of Salmonella-infected aneurysm of the internal iliac artery complicated by rupture and Salmonella hepatitis in a single patient. A 60-year-old male presented with a history of difficulty in walking and standing for 15 days, pain in the left thigh and hip region with low backache for 15 days, intermittent fever for 10 days, and yellowish discoloration of eyes associated with pain abdomen for 5 days. There was no history of loose stools or vomiting. On presentation, the patient had high-grade fever (101°F) and hypotension. On examination, the patient had icterus and tender hepatomegaly. There was no splenomegaly. Tenderness is present in the left hip and thigh region associated with edema of left lower limb. Neurological examination did not reveal any focal neurological defect. His blood reports revealed leukocytosis, conjugated hyperbilirubinemia, hypoalbuminemia elevated alkaline phosphatase, and gamma-glutamyltransferase. Ultrasound abdomen and pelvis showed mild hepatomegaly. Hepatitis serology was negative. Blood culture was sent which showed Salmonella typhi growth. The patient was started on intravenous ceftriaxone. During hospital stay, left lower-limb pain worsened. On examination, left lower limb was edematous with severe tenderness. Peripheral pulses were palpable. Venous Doppler showed no evidence of deep vein thrombosis. Magnetic resonance imaging (MRI) of the spine [Figure 1] was done with screening which showed large collection hematoma from D12 vertebra to inguinal region in the left side suggestive of ruptured aneurysm. Computed tomography (CT) angiogram [Figure 2] was done which showed well-defined lobulated aneurysm arising from distal common iliac artery with adjacent large hematoma which was considered as pseudoaneurysm. 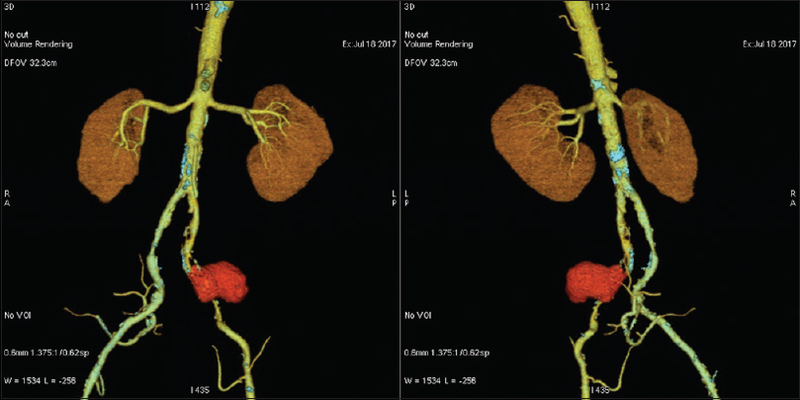 The patient was treated with endovascular stenting and repair of the aneurysm. Salmonella bacteremia was treated with antibiotics. The patient recovered from symptoms and subsequently was discharged in an ambulant condition. S. typhi is a Gram-negative bacillum. S. typhi can involve other body systems such as central nervous system (3%–35%), liver and biliary ducts (1%–26%), pulmonary system (1%–86%), cardiovascular system (1%–5%), bone and joints (<1%), and urogenital system (<1%) in addition to gastrointestinal tract. Aneurysm is focal dilatation of vessel wall. Infected aneurysm is defined as an infectious break in the wall of an artery with formation of a blind, saccular outpouching that is contiguous with the arterial lumen. Osler used the term mycotic aneurysm to describe aneurysms associated with bacterial endocarditis to denote the appearance of “fresh fungal vegetations” of infected aneurysms. In contrast to its name, mycotic (infected) aneurysms are caused by bacterial infections (Staphylococcus spp and Salmonella spp). Most important risk factors for development of mycotic aneurysm include arterial trauma immunosuppression and concurrent sepsis. Salmonella is reported in 15%–24% of cases of mycotic aneurysm. Mycotic aneurysms are most commonly seen in the intracranial arteries, visceral arteries, and peripheral arteries, typically at arterial bifurcations. Isolated (solitary) involvement of iliac artery resulting in mycotic aneurysm is rare. Salmonella is one of the rare causes of IAA. The symptoms of infected aneurysm include fever (77%) and abdominal or back pain (92%). Compressive symptoms caused by IAA include hydronephrosis (ureter compression), edema of lower extremity (iliac vein compression), painful defecation (colon compression), constipation (rectal compression) and paresthesia, lumbosacral pain, and sciatic neuralgia (lumbar plexus compression). Complications include rupture, aneurysm-related thrombosis, and thromboembolism. Five-year rupture rates for IAA range from 14% to 70%. Salmonellosis More Details in blood culture along with aneurysm causing compressive symptoms should raise the suspicion of mycotic aneurysm. Magnetic resonance angiogram helps in localization and determining the size and extent of an aneurysm. CT angiography helps in diagnosing infected aneurysm by demonstrating specific features suggesting infection. Liver involvement is commonly observed in patients with typhoid fever. Clinical jaundice occurs within first 2 weeks of febrile illness. Hepatomegaly and moderate raise of transaminases are common findings. Therapy of mycotic aneurysms includes surgical resection of the aneurysm with a bypass graft in combination with at least 6 weeks of antibiotics. Surgical management involves wide debridement of the infected area and either immediate or staged revascularization through an in situ bypass graft, an extraanatomic bypass grafting such as an axillary-femoral, or a femoral-to-femoral bypass. Extraanatomic bypass is the treatment of choice if the patient is stable. Ruptured mycotic aneurysm of iliac artery along with severe hyperbilirubinemia is a rare extraintestinal presentation of salmonellosis. Infrequently, we encounter these types of cases in our regular clinical practice. Such types of cases require diligent workup to arrive at a diagnosis. Early initiation of treatment increases the chances of recovery in such cases. Levi N, Schroeder TV. Isolated iliac artery aneurysms. Eur J Vasc Endovasc Surg 1998;16:342-4. Hata K, Miyata T, Deguchi J, Ishizawa T, Oshiro H, Shigematsu H, et a l. Rupture of internal iliac aneurysm due to Salmonella infection. EJVES Extra 2002;3:23-5. Huang DB, DuPont HL. Problem pathogens: Extra-intestinal complications of salmonella enterica serotype typhi infection. Lancet Infect Dis 2005;5:341-8. Osler W. The gulstonian lectures, on malignant endocarditis. Br Med J 1885;1:467-70. Johansen K, Devin J. Mycotic aortic aneurysms. A reappraisal. Arch Surg 1983;118:583-8. Brown SL, Busuttil RW, Baker JD, Machleder HI, Moore WS, Barker WF, et al. Bacteriologic and surgical determinants of survival in patients with mycotic aneurysms. J Vasc Surg 1984;1:541-7. Baddour LM, Wilson WR, Bayer AS, Fowler VG Jr., Tleyjeh IM, Rybak MJ, et al. Infective endocarditis in adults: Diagnosis, antimicrobial therapy, and management of complications: A scientific statement for healthcare professionals from the American Heart Association. Circulation 2015;132:1435-86. Uberoi R, Tsetis D, Shrivastava V, Morgan R, Belli AM; Subcommittee on Reporting Standards for Arterial Aneurysms of The Society for Vascular Surgery, et al. Standard of practice for the interventional management of isolated iliac artery aneurysms. Cardiovasc Intervent Radiol 2011;34:3-13. Richardson JW, Greenfield LJ. Natural history and management of iliac aneurysms. J Vasc Surg 1988;8:165-71. Sessa C, Farah I, Voirin L, Magne JL, Brion JP, Guidicelli H, et al. Infected aneurysms of the infrarenal abdominal aorta: Diagnostic criteria and therapeutic strategy. Ann Vasc Surg 1997;11:453-63.